Looking for an instant power boost for your solar panels? Slap on a large, transparent sticker by Genie Lens Technologies to get 10 percent more juice. 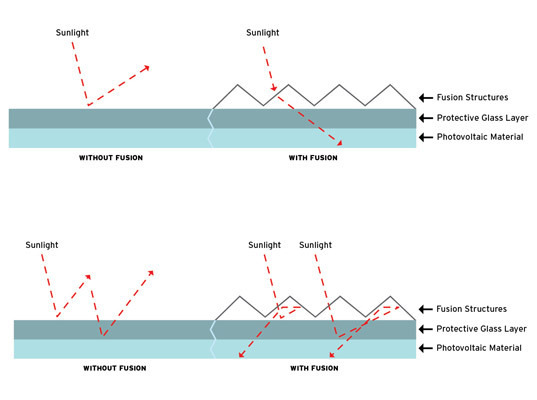 The polymer film, which can be applied to panels you already have installed, comes riddled with microstructures that bend incoming sunlight for better absorption. More light equals more electricity, which in turn lowers the per-watt cost of solar power. The inexpensive film works by preventing light from bouncing off the surface of the panel, according to Seth Weiss, the company’s CEO and co-founder. Not only does the sticker trap light inside the semiconductor materials that convert light into electricity, but it also diverts incoming rays so that they travel across — rather than through — the panel, bettering their chances of being absorbed. Tests at the National Renewable Energy Laboratory showed that the film increases power output by between 4 to 12.5 percent, with the biggest improvement occurring when the sky is overcast and incoming light is diffuse. Although adding the sticker, whether in the factory or on solar panels already installed, raises the overall cost of the panels by 1 to 10 percent, the additional electricity generated makes up for the price. A more efficient solar panel also means getting by with fewer solar panels, according to Travis Bradford, a solar industry analyst and president of the Prometheus Institute. As a result, other costs such as shipping and installation could also drop. Just one downside: Although the film has been rated for 20 years, it hasn’t been tested for durability — scratches, discoloring, and trapped dust can actually lower power output over time. hey i want to know how much a polymer sticker costs? Lukep-- Your point is generally correct. For example, in a concentrating solar cell where a big mirror focuses sunlight onto a tiny solar cell, excess heating often reduces the advantage of concentration. But, in the case of this film, solar warming is only increased by 10 or 20%- not enough to be a big concern. The reason it works better on overcast days is the little grooves bend light from scattered diffuse light back down into the cell- and this partially returns the efficiency back up to where it might have been on a sunnier day. So no adverse overheating. The overheating issue is real, and that's why some solar cells are mounted on a solar hot water collector- to sweep the excess heat away and store it in your basement's water heater. Actually a Bigger issue is that solar panels are all already designed to accept exactly so much sunlight in before overheating and becoming less efficient. So if this thing traps more energy in like they say, then your efficiency is sure to go down during the hottest parts of the day at least. (Which is supported by the fact that it works better in overcast situations.) The bottom line is that Manufactures need to be installing such a layer on their products because they know the upper temperature limits. Anyone else selling this is just GREENWASHING. The graphic illustrating how light transits their film is laughably incorrect- as any first year physics student would notice. 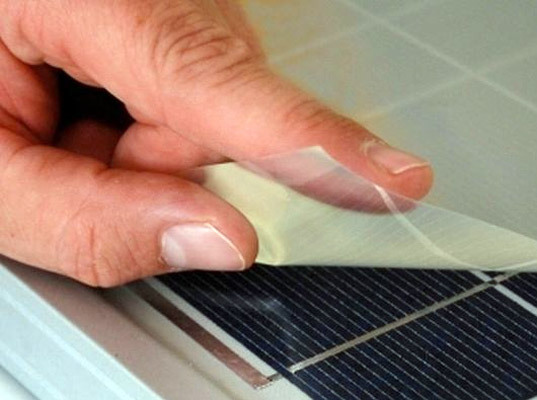 So its a bit concerning Genie Lens is publishing bad engineering, when in fact grooved and faceted surfaces are known to improve solar cell efficiency. The real issue is longevity- will these films stay clean from dirt and dust, and avoid yellowing in the sun?